Those who live in Petaling Jaya, Selangor would have thronged the morning SS2 market or chilled out with friends over a cup of teh tarik at Nasi Kandar Pelita. Day or night, the streets at the commercial precinct of SS2 are a constant hive of activity. SS2, which was first developed in the 1970s by S.E.A Housing Corp Sdn Bhd, is one of the largest districts of Petaling Jaya featuring one of its most established commercial hubs. The main commercial precinct of SS2 is bounded by Jalan SS2/75, Jalan SS2/60, Jalan SS2/55 and Jalan SS2/24 while other smaller commercial areas in SS2 are located along Jalan SS2/3, Jalan SS2/6 and Jalan SS2/103. “The commercial areas of SS2 are characterised mainly by 2-, 3- and 4-storey shophouses. More recently, there are bungalows, semi-detached and terraced houses in the locality that have been converted to limited commercial or business use,” says Knight Frank Malaysia associate director of residential sales and leasing, Kelvin Yip. Besides having an open wet market that operates daily for the convenience of the local community, there are also night markets or pasar malam in the area not once, but twice a week. “In the centre of the main commercial precinct, there is also a popular food court or hawker centre (Medan Selera),” Yip notes. According to him, the commercial centre is the focal point of SS2 and hosts every conceivable business, making it an extremely prosperous area pulsating with life day and night. As for its residential component, SS2 mainly offers double-storey terraced houses and it was only in the 2000s that condominiums began to come up in the area, says HASB Consultants (Selangor) Sdn Bhd director, Victor Huang Hua. According to data from TheEdgeProperty.com, the latest average transacted price of terraced houses in SS2 as at 2Q2016 stood at RM935,833, down 21.7% y-o-y. The highest average transacted price of terraced houses was in 2Q2015 at RM1.12 million. Meanwhile, the property market slowdown has seen the number of terraced house transactions in SS2 decline since 2014. As of 2Q2016, according to data collated by TheEdgeProperty.com, there were only six houses transacted, down by half from a year ago. In comparison, in 2Q2012, there were 27 units transacted. Huang notes that land area sizes for the terraced houses are generally between 1,540 sq ft and 1,920 sq ft with built-ups of between 1,600 sq ft and 1,900 sq ft while the majority of detached houses come with land area sizes of about 5,400 sq ft and built-ups of about 2,800 sq ft. According to Huang, transacted prices of the terraced homes 10 years ago ranged from RM500,000 to RM700,000 while they now range from RM1 million to RM1.7 million. The detached houses on the main roads were then in the range of RM1.5 million to RM1.7 million but they now command prices of around RM4.5 million. Houses on certain main roads in SS2 especially those fronting the main commercial precinct such as Jalan SS2/24, SS2/75, SS2/60 and SS2/55 have been gazetted for limited commercial use under the Petaling Jaya Local Plan 2 (Amendment 1), says Knight Frank’s Yip. These houses have become less conducive for dwelling due to the heavy traffic plying these roads and their proximity to the business/commercial area, he adds. “Effective April 7, 2014, owners of residential units in certain areas gazetted for ‘limited commercial’ use may apply for change of use by paying a premium. The limited commercial activities include art galleries, showrooms, agencies, professional services, medical clinics, IT-based businesses and creative arts. Being on main roads, any signage promoting the businesses would receive high visibility which would in turn generate more enquiries and visits,” says Yip. “Demand for such properties is high as there is limited supply. Certain businesses like bridal shops are most suitable to be located in these premises as they require good visibility, accessibility, exclusivity and privacy as well as parking although they are limited,” he elaborates. 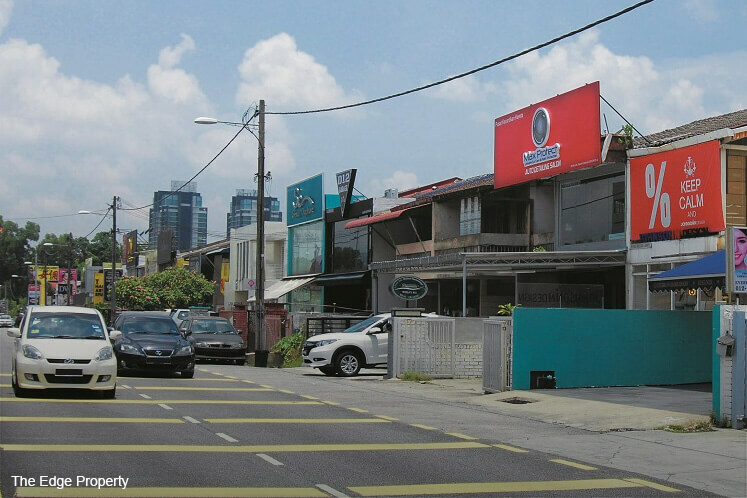 According to the data from Knight Frank, in 2015, the average price psf of 2-storey terraced houses with potential for commercial use such as those on Jalan SS2/75, with built-ups ranging from 1,895 sq ft to 2,149 sq ft was RM1.735 million. This is the highest price recorded since 2005. There were no transactions in 2016, but the firm estimates that the prices of these houses are holding. Besides their easy accessibility, HASB’s Huang notes that these houses generally fetch a lower rental compared with a ground floor shop at the commercial precinct. “Although mainly occupied by bridal establishments, there are other businesses that find the cheaper rental attractive including art galleries, old folks’ and confinement homes, law, accounting and estate agency firms, dentistry, tea purveyors and lightings, to name a few,” Huang says, adding that bridal shops can have a larger space as their studio compared with a ground floor shop space. Data from HASB show that the current asking rental for the ground floors of commercial shoplots range from RM8,000 to RM12,000 per month depending on the location. Meanwhile, the double-storey terraced houses that are converted for commercial use are asking between RM3,500 and RM5,000, depending on the location. “Ground floor shoplots will definitely command higher rentals than the upper floors as they offer good visibility to pedestrians and vehicles — important for businesses that rely on walk-in customers/consumers,” explains Knight Frank’s Yip. Data from Knight Frank showed that the compound annual growth rate (CAGR) for 3-storey shophouses in SS2 based on average transacted prices from 2006 to 2014 is circa 8% per annum. The average price psf of 3-storey shophouses with built-ups of 4,800 sq ft was RM885 psf in 2014 or RM4.25 million, up 15.69% y-o-y. Yip also notes that a corner 3-storey shophouse located along Jalan SS2/66 with land and built-up areas of 2,338 sq ft and 5,959 sq ft respectively, was sold for RM9 million in November 2016 (data from the Valuation and Property Services Department). “It is a rare opportunity to own a shophouse in such a prime prominent location. The shophouse commands exceptional high visibility and is especially good for branding. There are only a handful of corner shophouses in SS2 and demand is far more than supply. This being one of the better corners, it is undeniably a must-have. High rental returns are achievable due to its premium location,” says Yip. What makes SS2 so wanted? “The occupancy is constantly high in SS2’s commercial hub. In the event of a termination of a tenancy, there will be a new tenant within two to three months of vacancy. The maturity of the area itself and the establishments that have been there for years continue to boost the commercial market scene,” Huang says. He believes that more commercial zonings for other selected residential roads would continue to boost the commercial appeal of SS2. In terms of location, SS2 is strategically located with multiple access and egress from Federal Highway (Federal Route 2) via Jalan Universiti, Jalan Utara or Jalan PP Narayanan leading to SS2 from the Damansara-Puchong Expressway and from the Damansara Link of the Sprint Expressway. These roads lead to other major expressways such as the New Klang Valley Expressway, Kerinchi and Penchala Link of the Sprint Expressway, Middle Ring Road II (Federal Route 28), Jalan Kuala Selangor, New Pantai Expressway and Shah Alam Expressway. “Basically, SS2 has almost everything, including night markets (pasar malam) on Mondays at the main commercial area and on Thursdays at the Jalan SS2/10 where Kayu Nasi Kandar is located. The main commercial area has banking facilities, electrical stores, telecommunications, jewellers, various food outlets, brokerage firms, and boutiques or clothing shops,” he says. Huang, however, believes that the commercial area can be improved. For instance, the back lanes should be better lit up, while the parking facilities can be enhanced. He also suggests proper walking pavements with tactile for the disabled on all roads in and around the commercial areas instead of limiting them to just certain existing roads that have been upgraded. The current slowdown in the property market seems to have had minimal impact on the sale and rental of shoplots in SS2, according to Knight Frank’s Yip. “This is an established area with no known new competitor in the vicinity. The commercial shops in SS2 are well occupied and there are limited availability for sale. Although prices for the shoplots appear to have reached their peak in the current market environment, there is still potential for upside albeit at a slower pace,” he says. He also adds that future projects could possibly be developed on the limited development land still available such as at the SS2 park bordered by Jalan SS2/60, 2/61 and 2/63 and the plot of land bordered by Jalan SS2/61, 2/64 and 2/67. “Depending on the kind of projects, they may be able to lift the liveability and profile of the area such as with new lifestyle products,” says Yip. For HASB’s Huang, compared with other commercial hubs in PJ, SS2’s will remain vibrant and energetic. “It has its uniqueness that brings tenants and consumers to the area. To me, it will continue to attract investors and potential homebuyers as it is a mature township with good linkages and facilities to be enjoyed,” says Huang. This story first appeared in TheEdgeProperty.com pullout on March 24, 2017. Download TheEdgeProperty.com pullout here for free.